A member of the U.S. government met with organizers of Tuesday's "International Temple Mount Awareness Day" to pepper the activists about their intentions regarding Jewish ascent to the holy site. 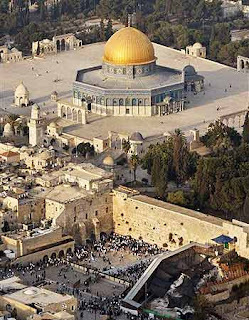 "It was obvious," one of the planners told WND, "the individual who met with us from the Obama government was concerned about the Jewish connection to the Temple Mount and what is being done to deepen it." The organizer talked on condition of anonymity and also on condition that WND kept confidential the name of the U.S. official who met with the Temple event planners. The International Temple Mount Awareness Day is being planned by a coalition of Jewish groups, including The Temple Institute, the Organization for the Renewal of the Temple (ORT), Women in Green, the Temple Mount Heritage Foundation and Israel National Radio. "We call on Jews and Gentiles around the world to mark March 16th as a day of solidarity with the Temple Mount and the prophetic vision of 'a house of prayer for all nations,'" reads a statement from the organizers of the event. In coordination with the Waqf, the Mount's Islamic custodians, police here ban all non-Muslims from praying on the Mount despite an Israeli Supreme Court decision requiring police to offer an arrangement that will enable public Jewish prayer on the site. The Israeli police cite security concerns for their Jewish prayer restrictions, explaining they fear the outbreak of Muslim violence if non-Muslim prayer is allowed. The planners of Tuesday's Temple awareness day are asking Israelis to arrive at the Mugrabi Gate, the entrance to the Mount, at 7:15 in the morning local time in accordance with directions posted on the institute's site. Institute leaders stressed they are seeking a peaceful public demonstration of solidarity with the Mount. Those outside Israel are being asked to "make known their dissatisfaction with the ongoing injustice to the Prime Minister of Israel, by telephone, by fax and by e-mail." Organizers of the event, including the Temple Institute, list a suggested protest letter text and contact information for Prime Minister Benjamin Netanyahu on its site. The Temple Institute is a group that works to restore a Jewish presence to the Mount, where the Israeli police bar Jews from ascending during most hours of the day, while Muslims are granted nearly 24-hour access. Organizers are also calling for those living abroad to "assemble in prayer and discussion, spreading the word and raising awareness about the injustices being committed on the Temple Mount." "We suggest holding prayer vigils outside Israeli consulates and the embassies," stated the Temple Institute. The Institute points out that according to the Hebrew calendar, tomorrow marks the anniversary of the dedication of the Tabernacle and the first day of the divine service. The Temple Mount was opened to the general public until September 2000, when the Palestinians started their intifada by throwing stones at Jewish worshipers after then-candidate for prime minister Ariel Sharon visited the area. The Temple Mount was reopened to non-Muslims in August 2003. It still is open but only Sundays through Thursdays, 7:30 a.m. to 10 a.m. and 12:30 p.m. to 1:30 p.m., and not on any Christian, Jewish or Muslim holidays or other days considered "sensitive" by the Waqf. During "open" days, Jews and Christian are allowed to ascend the Mount, usually through organized tours and only if they conform first to a strict set of guidelines, which includes demands that they not pray or bring any "holy objects" to the site. Visitors are banned from entering any of the mosques without direct Waqf permission. Rules are enforced by Waqf agents, who watch tours closely and alert nearby Israeli police to any breaking of their guidelines. Besides advocating for non-Muslim rights on the mount, the Temple Institute also focuses on preparation for the rebuilding of the Third Temple. The group has been preparing ritual objects suitable for Temple use. Many of the more than 90 ritual items to be used in the Temple have been re-made to the highest standards. According to research by Israeli Author Shmuel Berkovits, Islam historically disregarded Jerusalem as being holy. Berkovits points out in his new book, "How Dreadful Is this Place!" that Muhammad was said to loathe Jerusalem and what it stood for. He wrote that Muhammad made a point of eliminating pagan sites of worship and sanctifying only one place – the Kaaba in Mecca – to signify the unity of God.